NASA Ames uses HyperSizer software to optimize the first modular Common Bus vehicle for use in a moon-dust mission. Which is it – a lander, an orbiter, or a rover? In the NASA of old, a vehicle program would not have gotten off the ground without an answer to that seemingly simple question. However, in today’s financially leaner, commercially oriented NASA, decisions can sometimes stay up in the air for longer. That is certainly the case with one project – the aptly named Common Bus – thanks to a combination of visionary thinking and creative engineering. The result is an innovative spacecraft system that can be almost all things to all people – a lander and an orbiter and maybe even a rover. The Common Bus was the brainchild of the Ames Research Center’s Director, Pete Worden, who took over the Silicon Valley facility in 2006. His idea was to design and build low-cost spacecraft on a quick turnaround, utilizing a commercial off-the-shelf (COTS) strategy. The resulting small satellites would be used to perform modest yet important robotic tasks like meeting up with asteroids or investigating the lunar atmosphere. Within the newly established Small Spacecraft Division, the COTS concept promised to cut development time and, in Worden’s words, enable faster science return and more frequent missions. This modular approach meant that customization of all three types of spacecraft (landers, orbiters, and rovers) could be from the same starting components for differing instrumentation and payloads. It also helped achieve the original program time and cost goals, as set by the director: nimble missions with design-to-launch in less than two years, for as little as $50 million, or one-tenth the price of a conventional unmanned mission. At the heart of the Common Bus concept is a single monocoque (structural skin) blank that serves as the backbone of modularity. Each module is octagonal in shape and approximately 14″ x 46″. Each of its eight sides is comprised of two face sheets sandwiching a honeycomb core. Common bolt patterns on the top and bottom of the structure allow them to be stacked or interchanged such as LEGOs. This design strategy provides flexibility for mission type as well as easy replacement if there is damage during integration and testing (I&T). Before build-out, every module contains identical requirements and all of them look exactly alike. NASA’s Lunar Atmosphere and Dust Environment Explorer (LADEE) is a robotic mission that will orbit the moon to gather detailed information about the lunar atmosphere, conditions near the surface, and environmental influences on lunar dust. Although metals played their role, early in design development it was composites rather than more traditional aluminum or titanium that were selected as the primary materials for the Common Bus. “We chose composites because of their high specific stiffness, high strength, low weight, and low thermal distortion,” Fernandez says [see sidebar]. When each composite module is fabricated, high load and stress areas are reinforced during lay-up by adding more plies locally: the face sheets are two plies in the acreage (center), four at the edges, and six in the corners. Traditional add plies are eliminated by providing generous ply overlaps along the edges. This reduces mass and cost because doubled and tripled face-sheet zones can be added without extra engineering effort or significant new touch labor. In addition, modularity minimizes the post-cure bonding and panel-joining operations typical of traditional composite spacecraft manufacturing. To accommodate the variability required for diverse missions and ever-changing instrumentation, modules can be customized while a vehicle is being fabricated. These modifications can include things such as trimming away decks and/or walls to make room for internal equipment, or adding inserts for additional equipment attachment points. In other words, while the modules themselves can be a cookie-cutter design, in the end, each spacecraft will be unique. After lengthy design exploration, the Ames Common Bus took its first flight-program shape in 2008 as the Lunar Atmosphere Dust Environment Explorer, (LADEE). The spacecraft, which is scheduled to launch in 2013 and fly in low orbit around the moon, will analyze lunar atmospheric dust, a phenomenon first observed by Apollo astronauts on moon missions between 1969 and 1972. To house the necessary mission-specific instrumentation, the LADEE vehicle is four modules high, which is tall by small-satellite standards. The two bottom modules contain the propulsion system. Located on the top two tiers are instruments for avionics, communications, and the science experiments. These include: an ultraviolet spectrometer that uses solar occultation to examine the moon’s dust; a lunar dust experiment that samples and vaporizes the particulate; and a neutral mass spectrometer capable of measuring the mass and elemental makeup of the vaporized particles (see Figure 1 above). Solar panels are mounted around the sides of the modules. When assembled, LADEE’s four-module skeleton (without instrumentation) weighs only 102 lb. Of that total, 70% is composite-faced panels, 5% aluminum-faced panels, and 25% a combination of metallic inserts, fittings, and brackets. Once the scientific payload has been added in, the craft still weighs only 286 lb – about average for an NFL lineman but pretty light for a satellite. At launch, it will be about 800 lb wet mass. Minimizing structural weight for a spacecraft has obvious benefits. It saves fuel, allows for larger scientific payloads, and reduces manufacturing costs. As the materials and analysis lead on the LADEE project, Fernandez was responsible for watching vehicle weight along with the portfolio of software tools needed to find solutions and the engineers using them. The engineer’s tools included ProEngineerCAD with Windchill and MINX providing configuration control. ProMechanica handled analysis of small parts such as brackets. PATRAN served as the pre-processor and the home of the master finite element model (FEM), and NASTRAN was the workhorse finite element analysis (FEA) solver. To this software toolbox, Fernandez introduced HyperSizer, a structural sizing and optimization package for composites and metals, from Collier Research Corp.
Fernandez had learned the code (first developed at NASA) while taking a two-year detour from the Common Bus project to work on the Agency’s forward-looking Composite Crew Module (CCM). While there, he experienced hands-on how HyperSizer helped optimize and lightweight the CCM throughout the development cycle, reducing weight by about 20% and enabling the CCM to pass the strictest physical testing with flying colors. Back at LADEE, Fernandez suggested the tool as a complement to the collected capabilities of the other analysis software, and the team responded positively. “With flight program status and funding for LADEE in place, that is when the gears really started to turn hard,” Fernandez says. 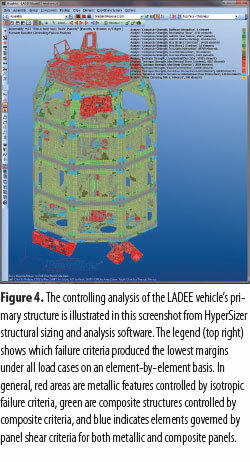 Early in design, the engineering group employed HyperSizer to perform rapid and extensive trade studies on the vehicle using the software’s extensive material property database (see Figure 2 above). Later on, as additional materials from literature sources and empirical in-house testing became available for flight material systems, their properties were easily downloaded into the software’s database and incorporated into the analysis. Once the team arrived at a working design, the fidelity of the FEM was sharpened by using HyperSizer to calculate detailed element-by-element margins of safety for each of the many applicable failure modes (see Figure 3 above). The structural portions of the LADEE FEM contains approximately 500,000 shell elements and were subjected to nearly 100 global load cases. On average about 20 failure modes – including core shear, flatwise tension, face dimpling, local buckling, and interactions – were checked for each element, depending on type (see Figure 4 on the right). 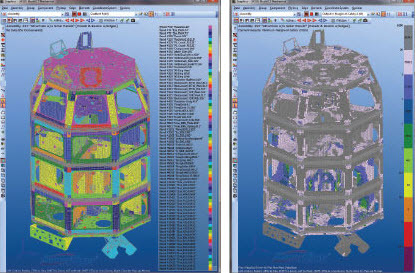 HyperSizer was used to verify the performance of both the composite structures and metal interfaces and bracketry. If all this work had been carried out using a manual approach (as was the case before HyperSizer was brought on board), the engineering team would have been forced to either simplify the analysis or hire more analysts to write in-house codes. According to Fernandez, simplifying the analysis means reducing the number of load cases to some minimal amount by including only critical structural locations while ignoring the rest. Doing things by hand, he further notes, would also be tedious. Analysts would have to interrogate stresses or strains at these critical areas on a case-by-case basis and then iterate several variations. By using HyperSizer throughout the design-test-build cycle, the engineering team could fully validate their modular design for LADEE. The software provided other benefits as well. During critical design review (CDR), for instance, Fernandez was able to produce graphical outputs that clearly illustrated structural margins, critical load cases, and critical failure modes. He could easily verify and record a multitude of element properties ranging from input loads to material and construction types. The tool generated a stress report that became part of the final Primary Structure Stress Substantiation Report. In addition, during fabrication, HyperSizer helped the team disposition non-conformances by allowing engineers to assess the impacts of fabrication imperfections based on margins in those areas quickly. While the Ames Common Bus idea was first born in 2006, HyperSizer was introduced after many of the baseline composite design and modularity details had already been worked out. “If the software had been available from the start, we could have taken advantage of some of its additional capabilities, including weight reduction during preliminary design and also further manufacturability improvements. I would also like to try using it as a data hub and exchanger for our other software tools,” Fernandez states. This additional functionality could be put to use on the Bus’ as-yet-unspecified second flight program. Additionally, while physical testing of all composite flight structures is still required at NASA, that practice is costly and will have to be scaled back to maintain missions with fewer resources, Fernandez predicts. “As managers and administrators become more confident in upfront analysis tools, they will be able to push physical testing further out in the development cycle or eliminate some tests altogether,” Fernandez states. 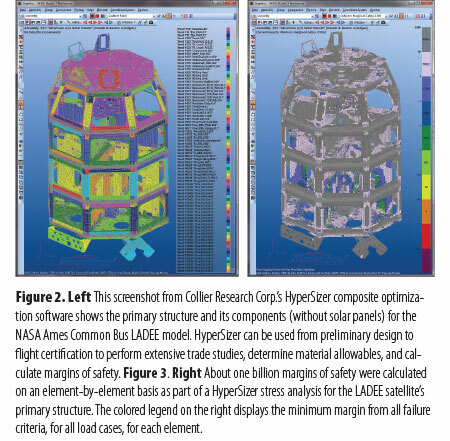 While HyperSizer is likely to stick as a standard tool for analysis at NASA Ames – having played an important role not only on LADEE and the CCM, but on other Agency projects such as the ARES I and V launch vehicles and the Orion Multi-purpose Crew Vehicle – the software’s full capabilities will also be relied on by Fernandez in his new position with a commercial aerospace start-up. In the future, aerospace design will undoubtedly lean more heavily on newer advanced materials and novel light-weighting structural strategies. As it does, early design optimization and analysis can provide an invaluable – and cost-effective – window into the performance of spacecraft in harsh flight environments. 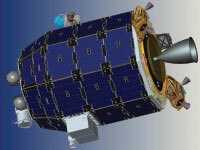 In the Bus’ first flight program iteration – the LADEE spacecraft – the composite panel structure uses T300 and M55J fibers with a Tencate RS-3C resin. Since T300 is a stronger and lower cost fiber, its usage is maximized. M55J, on the other hand, is used only in those areas in which stiffness is needed to maintain first-mode frequency requirements. Both are heritage materials from legacy NASA programs like the Super Lightweight Interchangeable Carrier (SLIC) that flew on the Space Shuttle’s Hubble Space Telescope service mission. Metals are used more sparingly, but where needed, on the Bus’ modules. All panels incorporate an aluminum honeycomb core. An aluminum-faced panel utilizes the heat-rejecting radiator. There are also various metallic elements throughout the structure. They serve as hard points for interfaces, bracketry for mounting components, and connection fittings between panels. Most interfaces are bonded aluminum inserts, their shapes optimized so that the material is sufficient for thermal survivability; this is important since aluminum is a lower-cost alternative to titanium. In addition, most brackets are aluminum, and of either sheet metal or machined construction. Panel-to-panel interface fittings, however, are bonded machined titanium, since their larger size prevents the use of the lighter aluminum.